You’ve probably heard conflicting reports about egg nutrition values. Some say eggs are a superfood packed with nutrients. Some say eggs are high in cholesterol so you shouldn’t eat them too often. Along that same line, some people say you should just eat egg whites. Before you read about egg nutrition values, let’s address why you shouldn’t worry about the cholesterol found in eggs. A medium sized egg has 186mg of cholesterol. That’s 62% of your recommended dietary allowance. That means you’re over your RDA after 2 eggs. The belief was that ingesting cholesterol would boost your risk of heart disease, but that’s not really the case. The more cholesterol you eat, the less your liver produces on its own. Your body works to correct your cholesterol levels. Therefore eating eggs won’t have a huge effect on your overall cholesterol level. Recent articles have shown the lack of hard scientific proof that eating high cholesterol food results in heart disease. Looking back at our ancestors, they ate eggs on a regular, daily basis. That’s because eggs are a great way to fill you and supply you with the nutrients you need. Egg whites are a great source of protein but the real value of the egg is found in the egg yolk. The benefits from egg nutrition come from eating whole eggs. Eggs contain a large variety of nutrients and vitamins. We’ve listed them below, along with the percentage of your RDA, based on 100g (2 eggs). Not all nutrients are present in large doses, but they’re still there and doing your body a lot of good. One of the largest benefits eggs will provide is the added protein to your diet. Protein has so many benefits including weight loss, increasing strength, and optimizing muscle growth. Protein lets your brain know it’s not hungry, reducing your appetite and stopping cravings. It’s not that eggs just have protein, they have the perfect type of protein. Protein is made up of 21 amino acids, 9 of which the body doesn’t make and must come through diet. Eggs are considered to have the perfect ratio of all of these acids. That makes eggs the go-to source for adding protein to your diet. Whether you eat a whole egg or just the whites, you will get a good portion of protein, but we recommend you eat the whole egg. Here are the benefits your body will receive from egg yolks. Eggs are rich in the brain nutrient choline. Most people are lacking in choline, so an extra 30 per cent of your RDA per egg is pretty awesome. Plus, not getting enough choline can result in liver and heart disease, as well as neurological disorders. The old idea that eggs are bad for your heart health simply isn’t true. In fact, eggs raise your HDH levels (good cholesterol). They also help enlarge your LDL (bad cholesterol) particles, making them easier to pass through the body. LDL particles are more dangerous in small, dense forms. Eggs are also great for your eyes. 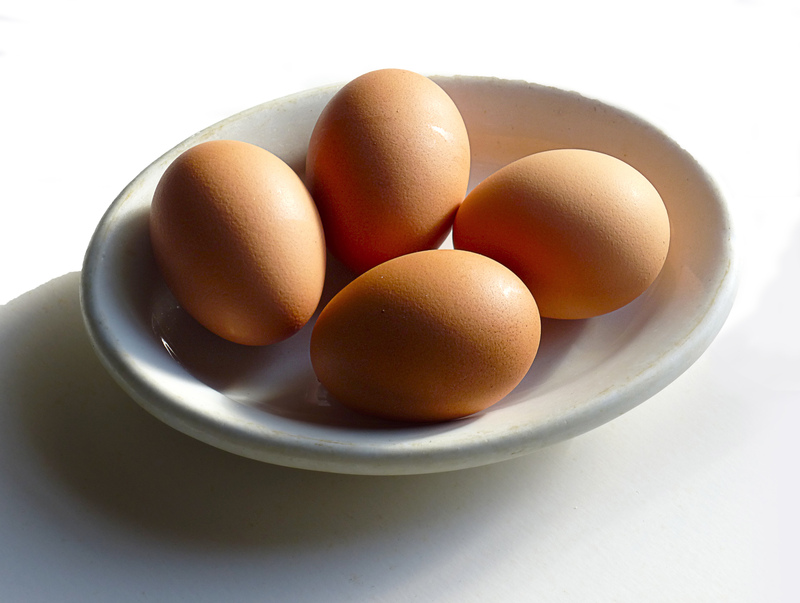 Eggs are high in antioxidants called Lutein and Zeaxanthin. They help protect your eyes from macular degeneration and cataracts. To make eggs even healthier, buy eggs from pasture raised hens. This has been shown to add omega-3 to your eggs and lower triglycerides. In short, eat whole eggs. They are packed with nutrients and are a perfect source of protein. When you can, buy eggs from pasture raised hens.